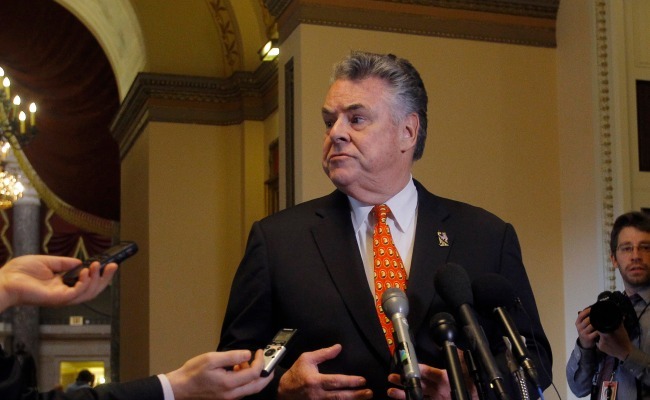 The U.S. representative from New York beat everyone else in declaring his 2016 candidacy. That's probably the only White House race he'll win. In an interview this week, the Republican lawmaker from New York who's perhaps best known for protecting America from scary "radicalized Muslims," told a New Hampshire radio station that he was in the state "because right now I'm running for president," according to the New York Daily News. King has been trying to generate buzz around the idea since at least as early as July, when he sent an email to supporters saying he'd been "floated" as a possible presidential pick by prominent members of his party. For your reading pleasure, here's a recent rundown of other candidates to declare earliest in recent years. John Cox, a "Ronald Reagan-style Republican," announced his candidacy after "getting a standing ovation when he outlined how he will solve the illegal-alien debacle." Ever heard of him? Thought not. The first Democrat to announce that year was then-Iowa Gov. Tom Vilsack. We're guessing you have heard of him. Gallup polls placed Vilsack at 1 percent in December of 2006. It fell to 0 percent on January 7, where it remained until he withdrew from the race. He is now the secretary of agriculture.